Save yourself both money and time by reserving your airport parking at Cork Airport (airport code ORK) before your next trip. There are three parking lots to choose from: A1 Airport View Parking Cork, Airport Lodge Parking, and Cork Air Park Services. All offer shuttle transfer to the airport. Cork Airport lies about four miles from Cork city, in an area known as Farmers Cross. Airlines that service Cork airport include Aer Lingus, Ryanair, Wizz Air and several seasonal airways. 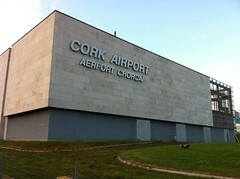 Cork Airport is the second busiest airport in Ireland, behind Dublin. Taxi: You can catch a taxi right outside the terminal building and the cost to Cork city center should be about €10-15. Rail: There is no service to the airport, but if you’re traveling into Cork first by train, the bus to the airport leaves from the train station. Bus/Shuttle: Both CityLink and Bus Eireann will take you from the airport to downtown Cork and cost more or less the same price.